I'm going to be honest for a minute and tell you that I hate vegetables. I am not a great cook so they end up mushy or nearly raw and I just don't like dealing with them. I end up throwing a salad together and calling it a meal. What I learned at New Moon Market though is that I don't actually have to eat them...I can drink them. New Moon Market is in the heart of College Park in Orlando. It's on Edgewater Drive which is the main drag through that Orlando neighborhood's center. 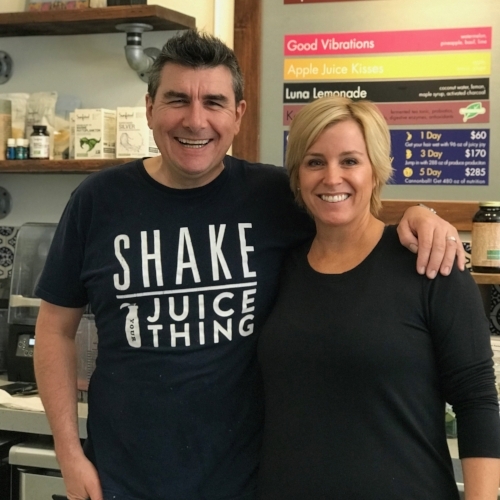 Jennifer Moon-Huggett, a Central Florida native herself, and her husband Paul have perfected the art of squeezing every delicious nutritious drop out of fruits and veggies. Not only that but they've got an expanded menu of toasts and grab and go salads that are rich and yummy and so so good for you. College Park is made up of young professionals, families and dogs and kids and lots of bikes and people walking and yoga-ing. It's chill. If you're looking for a healthy stop in the middle of chill-town, this is it. You can call ahead to place an order or just grab made-fresh-daily items from the cooler. You can also order from the menu and even set up a consultation for a juice cleanse with Jennifer herself. What are some of my favorites? Rainbow Pad Thai Salad - Spiral zucchini with a medley of red cabbage, carrots, and bell pepper with seasoned quinoa. Served with Thai peanut dressing on the side. Chickpea Salad Toast and the Sweet Toast with almond butter and banana. Jennifer loves her Power Shot. Paul goes for Wheatgrass every single day. Note: Bring back the glass bottles and they'll recycle them for you. All juices are made with 100% organic ingredients and have not been pasteurized (No HPP). No additives or preservatives.